I waffle. Sometimes I think new year's resolutions are fabulous, sometimes I think they're for the birds, and sometimes I think they only work if you don't tell anyone (like a birthday wish). I can't make up my mind for sure, but I think any negative feelings I harbor may be directly related to how hopelessly I'm failing at my resolutions at any given moment... not that I've ever failed. Pffft... not me. But just this evening I was lucky enough to see this fun post written by Edie of Life in Grace, and so I've decided to scrap my original post in order to go ahead and make resolutions "with reckless abandon" this year. I might not accomplish all of them, but If I don't challenge myself then I certainly won't accomplish any of them. The best one? Making my bed every day. Talk about dreaming big! You go girl! 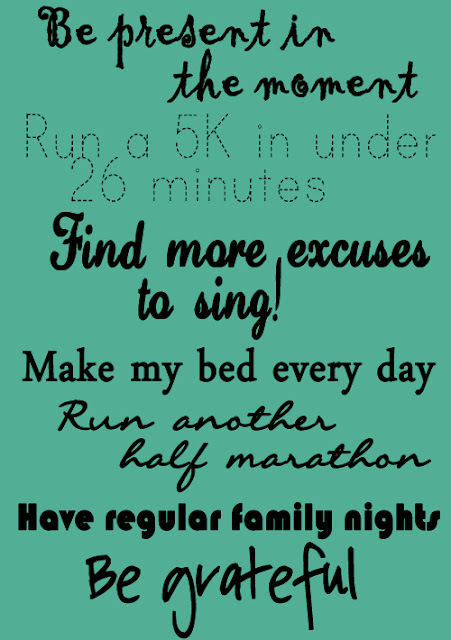 I'd settle for just running a 5k regardless of the time ;) I hate running! Happy New Year! ha ha, I'm with you on making my bed. Right now, it's once or twice a week. Bro. David Steindl-Rast has the ticket for "be more grateful" -- he says it's not happiness that makes us grateful, but gratefulness that makes us happy. I think he's right.